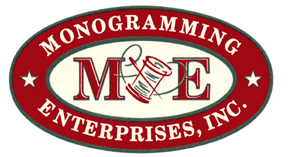 Monogramming Enterprises, Inc. offers the finest quality custom embroidery, silk screening and related services to the apparel and promotional industries. Our goal is to bring fashionable and quality branded apparel and other items to customers through our superior products and services. Our mission is to re-create your thoughts, ideas, brands, and logos on imprinted apparel, promotional products, and marketing materials with the highest quality, timeliness, and affordability.